Fisker is finally taking a stab at Tesla and Elon Musk. After months of teasing on Twitter, Henrik Fisker has finally set a date for when his comeback car, the ultra luxury, all-electric, fully autonomous EMotion sedan, will make its world debut. The EMotion is set to debut at CES 2018 in January, Fisker told TheStreet in an interview. Fans can get a firsthand look at the $129,000 vehicle that's expected to rival Tesla Inc.'s (TSLA - Get Report) Model 3 and the Faraday Future FF 91. Fisker Inc. will also be showing off some of the EMotion's next generation technology, including the energy density battery pack, which he promises will be superior to existing EV technology, charging the car in just 9 minutes, as well as LIDAR technology that, while still in development, will drive the car's level 4 autonomous system. Fisker says the car has a range that exceeds 400 miles. The EMotion won't actually ship until 2019, but Fisker Inc. started taking pre-orders in June with a $2,000 deposit. In a bid to match Tesla's cheaper Model 3 sedan, Fisker said the company is simultaneously working on an affordable version of the EMotion that's due out in 2020. He's aiming for it to be priced around $34,000 -- a $1,000 discount to the Model 3, which starts at $35,000. The legendary Danish-born car designer has been plotting his return to the car market ever since his first luxury, plug-in hybrid vehicle, the Fisker Karma, went bust in 2011. Fisker Automotive filed for Chapter 11 bankruptcy protection two years after that, and, in 2014, was sold to Chinese auto parts supplier Wanxiang Group for just over $149 million. Fisker had been on a three-year hiatus, before returning to the industry under his new namesake car company, Fisker Inc., in 2016. Fisker has long-standing ties to the automotive space, having designed iconic cars like the BMW Z8 and the Aston Martin V8 Vantage, among others. 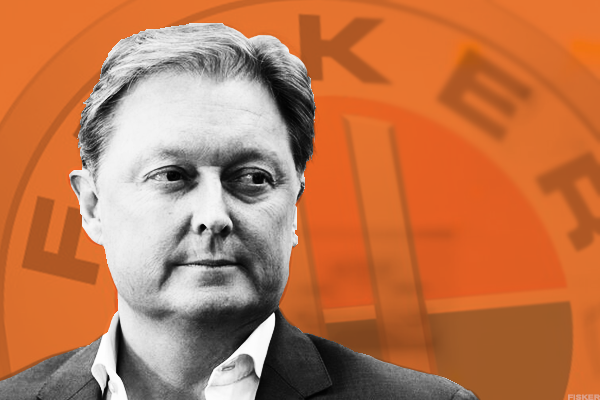 Veteran automotive designer and Fisker Inc. CEO Henrik Fisker. A lot has changed since Fisker first tried to release an electric vehicle. Where Fisker failed to successfully navigate the market, Tesla has made considerable strides. Billionaire Elon Musk's car company just reached a major milestone with the July release of its first affordable sedan, the Model 3, which many believe will propel Tesla to profitability, as well as help land electric vehicles in the hands of average consumers. All-electric vehicles still only account for less than 1% of new car sales. Fisker said he's not deterred by Tesla's progress; instead, he said he's more intent than ever on disrupting the auto industry. He shirks people who label the company as a "Tesla killer" or a "Tesla rival" because he believes there's room for multiple players in the electric vehicle space. "I don't think anyone is out to kill anybody," Fisker said. "Tesla doesn't really have a competitor. It doesn't look like one is going to emerge. I think it's time to move to a next level of this technology and I believe that we have come up with some real breakthroughs." To start, Fisker's EMotion has a futuristic design that makes it look distinctly different from Tesla's comparable, high-end Model S. It's made of carbon fiber and aluminum to be lighter and has four butterfly doors. Fisker said the front face of the car is designed around the LIDAR system, which is housed behind an aluminum centerpiece, and 360 degree cameras are embedded in the side mirrors to give the driver a 360-degree view. Fisker has remained relatively tight-lipped in releasing details about the EMotion's autonomous driving technology, but said the company is working with several suppliers to get the technology off the ground. For now, Fisker said the EMotion's autonomous features are best used on freeways instead of suburban environments. "Eventually, as we get better at autonomous driving, of course it would expand, but I think one of the best places to use autonomous driving is on the free way in stop and go traffic," he explained. "That seems to be the best place to introduce fully autonomous driving." Admittedly, it's hard to think about the EMotion without remembering Fisker's failed Karma vehicle. 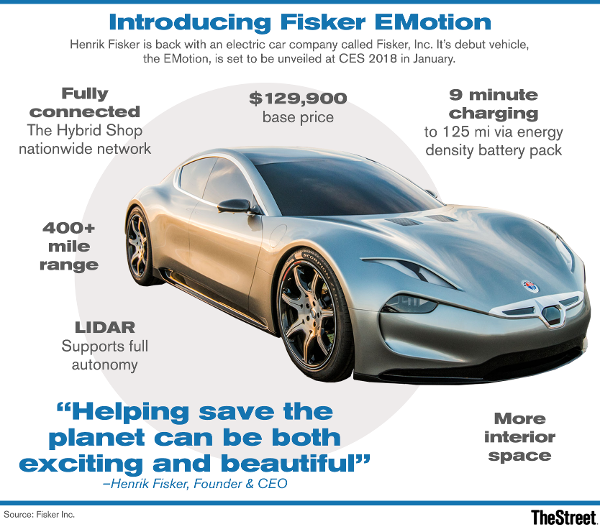 But now Fisker will have a chance to put his bold claims to the test at CES next year. How will the EMotion compare to the Model 3?